Goal: The substitution of Gerstley borate. When we try to “remake” Gerstley borate from materials which are commercially readily available on the market, it is necessary to have the chemical formula of Gerstley borate. 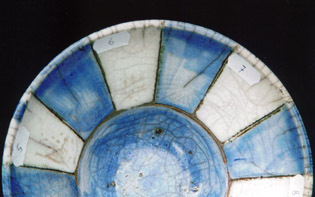 As a starting point the calculations and the experiments were used to “remake” Gerstley borate, but the real purpose is to make an useful recipe for the Raku potter. The experiments are reported in sequence of execution and although this is perhaps not optimal from a didactic point of view, the final recipes are fortunately very simple. Used materials and the chemical formula. Choose materials with a simple chemical formulation and then calculate after that the amount of these materials to obtain ( as close as possible) the wanted recipe. We use the Seger formulation, because this is the most simple way. To illustrate this procedure, we took recipe 2) as an example. First we choose for a Na2O source: let's take a fritte 1451 in the amount of .12 mol. We will now balance the amount of B2O3.The total amount is .59 mol but with fritte 1451 we have already supplied an amount of .24 and so there is a rest of .35 mol. The ultimate result is the sum and this is in good accordance with the desired recipe. This isn´t very difficult, but it isn´t always possible to get a solution (especially when the materials are more complex). 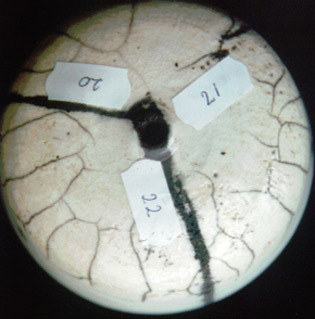 Try to make the sum of the earth alkali oxides (Na2O K2O MgO CaO) around 1 . 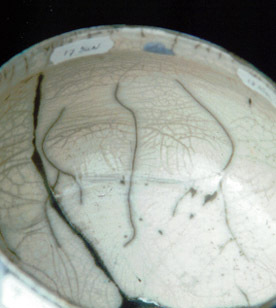 In the course of the experiments the target to exactly "remake" Gerstley borate has been abandoned and instead we have focussed on the appearance of the glaze. The Seger formulation has been calculated each time, but it is only purpose to guide us in making logic changes to the recipes. 1) The closest approximation of Gerstley borate with the frittes 3221/1451. 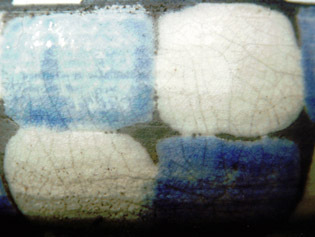 This glaze gives gas-bubbles, clearly visible in the picture with the blue colour. Crackles are not developed very well. 2) The closest approximation of Gerstley borate with the fritte 1451 and colemanite, the other materials are the same as 1). 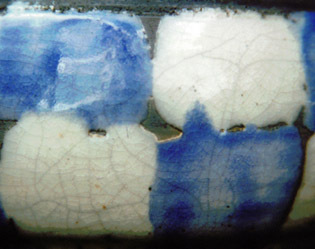 This glaze hasn’t melted well, the blue colour is more dull. 3) The materials were chosen in such way that there isn’t any forming of CO2, as in the case of using whiting or dolomite. Colomanite is chosen as B2O3-source. 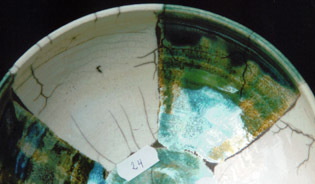 The two new materials introduce more SiO2 and the glaze gives a poor crackle and melts bad. 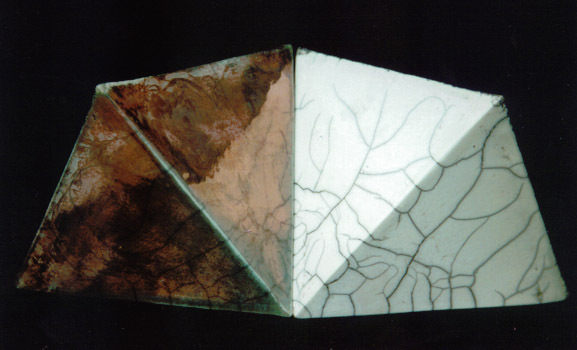 4) Same materials as 3) with more colemanite to get a lower melting temperature. 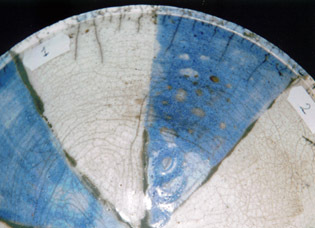 The larger amount of colemanite gives this glaze a better melting behaviour. In the series this recipe gives the best results. Number 7 in the series gives the best result.Also here we can see that a higher content of B2O3 gives beter results. In this serie the B2O3 content has increased by Colemanite (and not by the fritte 3221). 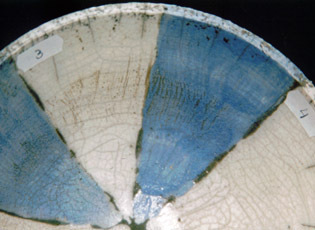 In the series 5-7 the content of colemanite has been increased, at the same time the content of wallastonite has lowered to zero. (The content of Na2O, MgO, CaO is always the same). 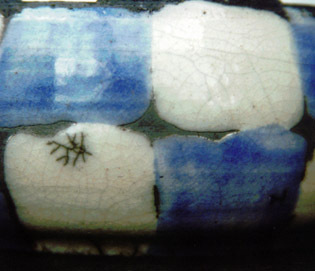 By increasing the content of colemanite the amount of gas-bubbles is also increasing as you can see by the pinholes in the glaze. Number 7 in the series gives the best result. Decrease of the content of fritte 1451 to zero, but now fritte 1510 as a source of Na2O. 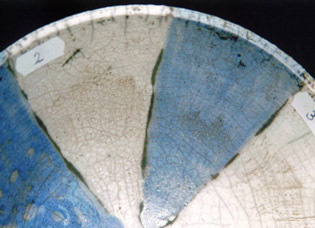 This experiment is carried out to see if the pinholes -by using colemanite - were caused by the low melting temperature of fritte 1451. (The result of the experiment 12) wasn’t known, otherwise this result would make clear that the melting behaviour of fritte 1451 didn’t have any influence). 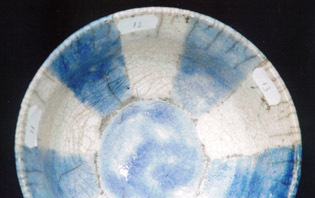 The glazes are rather bad with in general many pinholes , there are a lot of gas-bubbles during the firing. In experiment 12) the Na2O content has been lowered to zero and this has no influence on the results, as a consequence also the amount of MgO has been decreased to see what happens. This is done with Colemanite as well with fritte 3221 as a B2O3 source. 14) content of talc in recipe 12) is now 0. 16) same as 15) now without talc. 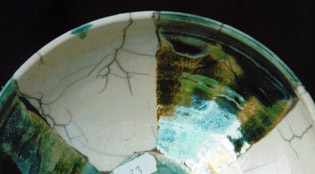 The result of the experiments 15-16 are the best, there isn’t any gasformation during the firing and that’s the reason that there aren’t any pinholes in the glaze. Experiment 14, with only colemanite, gives a lot of gas and pinholes and a rather bad crackle. 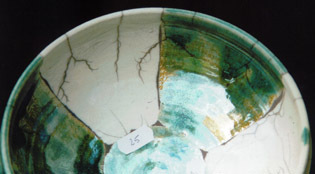 The use of colemanite in Raku glazes isn’t a good choice! (although the price of the material is low.) A special addition of Na2O, MgO, CaO isn’t necessary when we use nepheline syanite !! 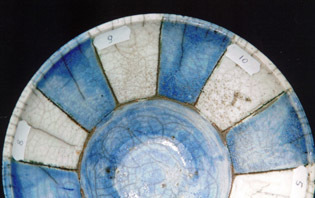 Now that we know that only with fritte 3221 and nepheline syanite it is possible to make a good glaze we want to examine if the ratio between the two materials (till now always in weight-ratio 1:1) has a pronounced effect on the results. Thin layer gives better crackles. Conclusion: thin layers give a better crackle than thick layers. There is a small difference in the ratio of the fritte 3221 and nepheline syanite, experiment 17/18 is a little better than 19 and fortunately it is cheaper too!! The recipe found up to now is good and simple, however it’s difficult to spread and so the possibility to apply the glaze with a brush isn’t optimum. In this series ball clay is added to improve the spreadability. 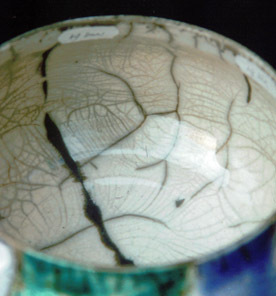 In the forming of crackles there is no big difference between the recipes. In experiment 22 the spreadability (and also the strength of the layer) is comparable with Gerstley borate (which is excellent to apply with a brush). In an attempt to make the recipe more complicated (you are an alchemist or not.) I have played with some additions of Na2O in the form of salt (NaCl) or soda (NaHCO3.H2O). There wasn’t any difference in results, pity? No! because simplicity is also beautiful. fritte 1451, dolomite, whiting, fritte 3221 (or colemanite). 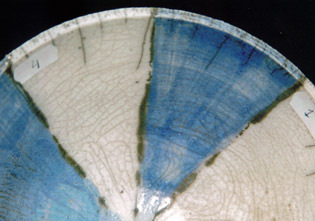 The gas-bubbles formed during the firing of the glaze are produced by the decomposition-gasses CO2 (whiting/dolomite) or H2O (colemanite). This can be prevented by using wollastonite and talc as a source of CaO and MgO (although then extra SiO2 is added). Calcium borate fritte 3221 (Johnson/Matthey) is very suitable as a source of B2O3 and is much better than colemanite (pinholes). In the experiments you can see that only nepheline syanite and fritte 3221 are very useful. 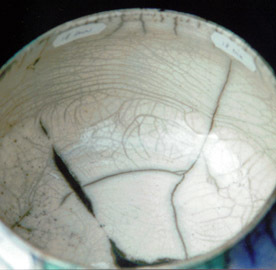 The spreadability of the glaze is improved by replacing a part of the nepheline syanite by ball clay.